Thursday 16 Nov: Extending existing applications for secure mobile use – how tough can that be? Posted November 16, 2006 by grohling & filed under Uncategorized. Extending existing applications for secure mobile use – how tough can that be? 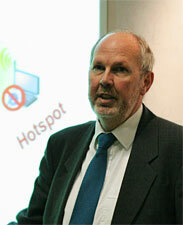 Our speaker was Stef Coetzee, Senior VP International, NetMotion Wireless. Stef described the challenges of running applications from mobile wireless devices, where the signal strength and data rate can vary widely and sometimes drop completely as the user moves between wireless hotspots and mobile phone cells. He outlined an emerging category of products referred to as Mobile VPNs, specifically crafted to cater for the needs of secure wireless computing. With bandwidth-challenged wireless networks, the protocol overhead becomes relatively large and can take an increasing proportion of the available bandwidth. Stef described the communication stack demands of a Mobile VPN which could preserve application connectivity as the user moved from one type of network to another, and even hold the application connection when the physical connection was temporarily interrupted (when roaming from one network to another or travelling through a tunnel, for example). This ideal application might also be sensitive to the nature of the network being used and introduce protocol optimisations and downsample marketing-type images when bandwidth was low. He finished by describing several pilot projects, from various industry sectors, where such adaptive software has been used, and some surprising benefits in addition to the expected performance increases. See the slides for more information. Stef’s slides are here (2.2MB) and also linked from our downloads page.